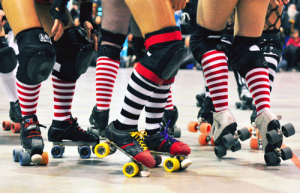 Roller Derby is a great way to promote athleticism, strength, self esteem, and leadership among women and men. Just like other sports teams, roller derby teams and leagues need help fundraising. This be daunting with so many different types of fundraisers out there. Giving Bean’s coffee fundraiser is the perfect for your Roller Derby team fundraisers. With Giving Bean’s coffee fundraising program you will raise funds easily and effectively with no startup costs. Giving Bean features products that people use daily making them an easy sell. Freshly roasted small batch coffee, artisan teas, and all natural gourmet cocoas. There is something for everyone. You will make 40% with our traditional paper fundraiser as well as 25% with online sales. This feature is great for anyone who wishes to support you but doesn’t live in the area.